Milkweed is crucial to the survival of the monarch butterfly, but since the Midwest was settled and turned to agriculture a lot of the habitat has gone. The Iowa Monarch Conservation Consortium is organized by Iowa State University but involves a lot of agriculture organizations looking for ways to work with farmers to convert land to monarch habitat without disrupting production. At Iowa State University, Extension weed scientists are researching milkweed. They're looking for varieties liked and used by monarch butterflies. Extension's Bob Hartzler says, "We're working on how we can best make recommendations for farmers to establish this type of habitat." That would be working with the soybean association to put habitat on top of bioreactors or working with the pork producers to add blocks of milkweed next to hog confinements. Hartzler shows a monarch caterpillar on the broad leaf of a dominant milkweed species. For years the monarch population has dwindled and a lot of that is because of agriculture with farmers wanting those weeds out. Hartzler says, "With changes in agriculture we have seen reductions with the amount of milk weed found in crop fields and how important those milkweeds were to the monarch is uncertain, but undoubtably they were being utilized by the monarchs." While being a good habitat for monarch butterflies and other pollinators milkweed is still a weed. And so asking farmers to let it back into their field by reducing herbicide use, could also let in other types of weeds." 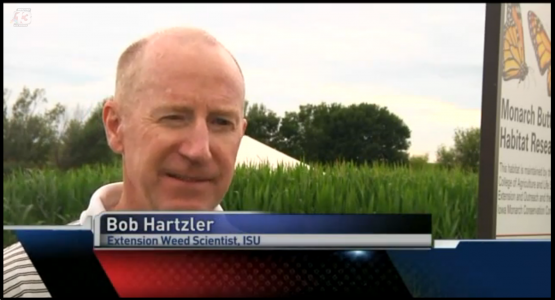 Hartzler says, "Because of the dominance of corn and soybean production, there are not a lot of resources for the monarchs and lots of other beneficial organisms and we realize we can't cut back the productivity of Iowa land but we realize across the landscape there are areas that we could increase a little diversity and have a huge impact on things such as the monarch butterfly."